One Year After Morsi, How Goes Egypt? Egyptians took to the streets in numbers never seen anywhere, ever on June 30, 2013 to protest against their Islamist president, Mohamed Morsi. Three days later, Defense Minister Abdul Fattah al-Sisi responded to this outpouring by overthrowing Morsi. How do things look now, exactly a year later? Pretty awful. Looking at the two most urgent arenas, Islam and the economy, almost nothing offers a sign of hope. In the debate over the proper role of Islam in the lives of Egyptians, the dividing lines have only increased, spawning violence, further extremism, and a sense that the country's split between Islamist and anti-Islamist factions will last for many years. Even the dividing lines among Islamists and among anti-Islamists are hardening. The inscrutable Sisi presides over this mess as the new Husni Mubarak, stolid and repressive, with his own views seemingly contradictory and elusive. A street scene from January 2014. 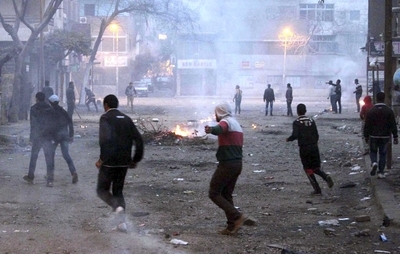 Egypt has seen steady violence since the coup d'état a year ago. Egypt's economic decline continues apace. Income is down most everywhere one looks – direct foreign investment, remittances from workers abroad, tourism. Perhaps most symbolic is that until April 2012, the country sold natural gas to Israel; less than two years later, it buys natural gas from Israel (at more than four times the old selling price). Pervasive food and energy subsidies distort the economy, as do the ubiquitous military industries. Red tape remains stifling. The country unsustainably depends on subventions from rich Persian Gulf states to pay for imported foodstuffs. 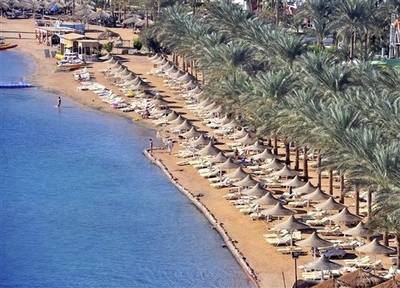 Few tourists go to the beach at Sharm el Sheik or other Egyptian resorts.